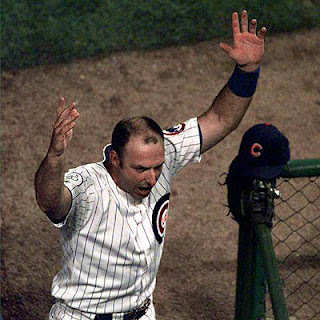 Congratulations to Gary Gaetti, the best backup to Mark Grace in the 90's. This was a closer vote, as Gaetti received 50% of the votes. All of the men garnered at least one vote. Gaetti joins Hector Villanueva in the Towel Drills Hall of Champion Backups. Some of you loyal Towel Drills fans may be saying to yourself, "Wait. I remember Hector Villanueva also played a little first. Why couldn't I vote for him?" Well, we here at Towel Drills want to recognize as many great former Cubs as we can, so once a backup has won, he is no longer elgible. That way, when the Hall of Champions is erected in the beautiful Towel Drills Corporate Headquarters, we will have an entire hall and not just a single photo of H.V. Don't forget to vote for your favorite 2-sack! Gaetti looks like he's trying to scare some little kid sitting in the front row in this picture. Bummer on the hair line too.